NiftyGridZPro is a fabulous new tool for promoting Zazzle products. Mark Highton Ridley created an extremely flexible way to showcase Zazzle items in a grid. Right off – there is a free version and a paid version. This is wonderful because you can either just use the free version or test it out to see whether the paid version is right for you. This is for WordPress sites. 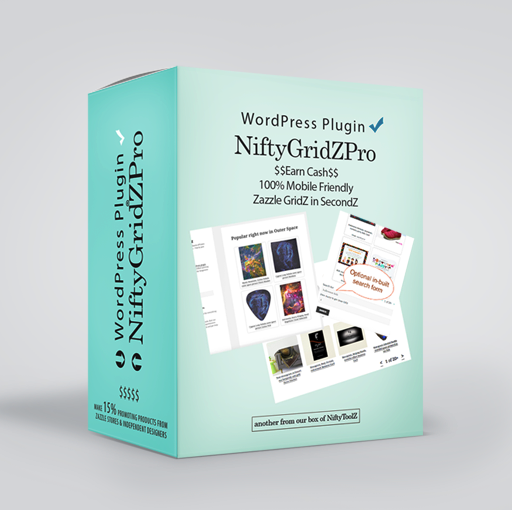 NiftyGridZPro is a plugin that is very easy to install into your WP blog. Mark shares detailed information, in a very simple format, to teach you how to install and activate this (and other) WP plugins. Then the fun begins!! One wonderful feature is there is a way to create grids of products in case Zazzle’s feed goes down. Any of us who have relied on Zazzle rss feed know there are times – sometimes for long periods of time – that it just plain disappears. This has a solution to that problem! The grid plugin allows you to make lots of choices. You may choose items from a certain shop, from a collection or from the marketplace itself. Of course, you choose which type of product goes into the grid. If none are specified, then any items from the shop, collection or MP go into the grid. Of course, you specify your own affiliate code. There are tracking codes both for the primary grids and the back up grids so you know where the sales are coming from. NiftyGridZPro is very remarkable because it is easy to change the background colors of the items, the grid color and several other style choices. It is very simple to include – or not – price, shop from where the product comes, descriptions, tags. Order of the items, size of the grid cells and promo codes are all easy to add. Though personally, I find the default settings very well thought out and useful. It is easy to get the html code to put into a file, either for backup grids or to use on a page. Mark details some of the best ways to work with backup files. He has very clear, simple explanations for each step of the way. This is one grid page I created https://www.dianeclancy.com/products/delightful-bubblescape-mugs-from-zazzle. These mugs are Bubblescapes. Whereas this grid page https://www.dianeclancy.com/shops/colorful-joyful-patterns-mugs features mugs with some of my patterns. So the only real change between these 2 pages is the store I pulled the mugs from. Yet you can see the grid carries very different images on the mugs. And of course, the grids are responsive so they are perfect for mobile too! And there is an advanced feature you can use for incorporating into pages, but that is just one more extra! I suggest you get some grids with the NiftyGridZPro going and see how easy it is!! Mark provides help via email or the Zazzle forum and he replies very quickly! I personally am delighted that I chose to get NiftyGridZPro to help with my Zazzle promotions. It has helped get me back in gear!